Hello and welcome to my stop of the blog tour for The Art of Holding On and Letting Go by Kristin Bartley Lenz. When I was presented with the opportunity to read and review this book, I was immediately intrigued and said yes. Said review can be found here. Then I also got the opportunity to be part of this blog tour, to which I obviously said yes, too, because you guys know I love debut authors and interviewing them about their books, so how could I not say yes? Expected publication: September 12th 2016 by Elephant Rock Productions, Inc.
1 - Describe The Art of Holding On and Letting Go with a haiku (or twitter pitch). 2 - What was the first initial thought or thing that sparked the idea of The Art of Holding On and Letting Go? My husband and I became immersed in rock climbing when we moved from Michigan to Georgia, and then to California. We followed the careers of well-known mountaineers, and one by one, each of these climbers died attempting epic summits, leaving their spouses and children behind. I began to wonder what it would be like to be the child of a famous mountaineer. How would that child’s upbringing be different? And what if both of her parents were extreme mountaineers, not just one? How would this shape her world? 3 - What do you like most about your protagonist Cara? I like that she has grit and tenacity and a big heart. 4 - What was the most challenging about writing The Art of Holding On and Letting Go and which scene was the most fun to write? It was challenging to describe rock climbing without being too technical. My favorite scene to write was when Cara climbs at the viaduct by her grandparents’ house. It was fun to play with the language, and it was in that scene that I found the book’s title – The Art of Holding On and Letting Go. 5 - How long did it take you from first thought until publishing deal? Ten, very long years! I worked as a social worker and wrote other stories during those years, but TAOHOALG was revised, submitted, shelved, and revised again every few years until I connected with the right editor who shared my vision. 6 - How do you feel about the fact that in a couple of weeks, hundreds of people will be able to read your book? It’s nerve-wracking! This manuscript has received a lot of praise and support from agents, editors, and fellow writers over the years. I’ve grown as a writer through this process and I’m confident that I’ve produced a work of quality literature, but I know it won’t be for everyone. Very rarely has my book club ever unanimously loved a book; we’re all drawn to different aspects of stories. But it’s been so fun to correspond with some of the early readers who have really connected with my book. 7 - In retrospective, is there anything that you’d change about the story or are you happy with the way it turned out in the end? The more time I spent in Cara’s world, the more details I wanted to add. I could revise endlessly, but at some point I needed to stop and trust that I’d shared enough of her story for readers to understand and make it their own. I’m happy with the book, and ready to move on to a new manuscript. 9 - Did you listen to any particular songs or artists while writing The Art of Holding On and Letting Go? If so, could you give us an example? Connect with other writers in your area or online to share resources, give and receive feedback, and encourage each other to persevere along the bumpy path to publishing. SCBWI is a really supportive organization if you’re writing for children and/or teens. Invisibility. There are so many times that I want to be a fly on the wall and just observe. I love watching and listening much more than talking. Kristin Lenz is a writer and social worker from metro-Detroit who fell in love with the mountains when she moved to Georgia and California. Now she’s back in Detroit where she plots wilderness escapes and manages the Michigan Chapter blog for the Society of Children’s Book Writers and Illustrators (SCBWI). Her writing has been published by online literary journals, including Hunger Mountain and Great Lakes Review. 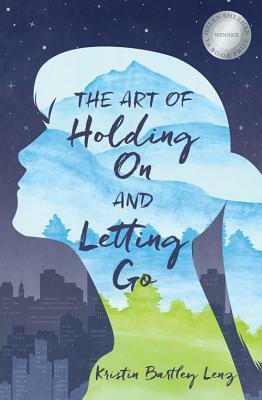 The Art of Holding On and Letting Go is her first novel. Thurs., Sept. 1 – Kristin interviewed on Crazy Book Obsessions! Thanks for your support, Alice, and best of luck with your own writing too!